At AZUR Cp. Ellwangen a.d. Jagst in Ellwangen (Baden-Württemberg) camping costs as little as €20,- per night during low season with CampingCard ACSI. At one of the 80 touring pitches you will get a discounted rate during the period 06-04-2019 - 29-06-2019 and 26-08-2019 - 19-10-2019. At this campsite you can not only use your CampingCard ACSI for inexpensive camping, you can also use your ACSI Club ID (as an alternative ID). For a municipal campsite this one has a lovely setting on the Jagst, next to an indoor swimming pool. Perfect for an overnight stop but also suitable for a longer stay to see what the local area has to offer. Starting point for various cycle paths for young and old. Stayed for an extended period, despite a lot of rain, the visit was well worth it. Quiet comfortable site, lovely surroundings and good disabled facilities for my wheelchair-bound wife, short walk on a footpath to beautiful town centre. Visited a number of attractions nearby, e.g. 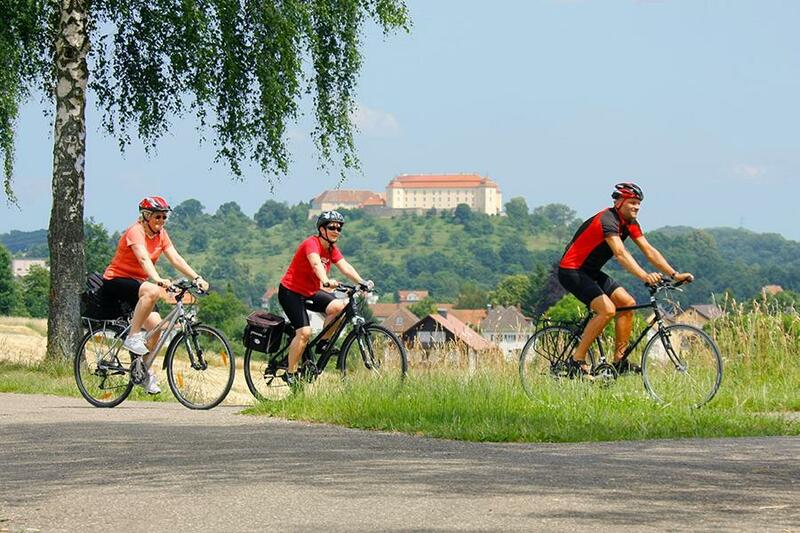 Vellberg (<30km) which is a 16th century fortified town with stunning buildings, or Bucherstausee just a few km away with long walks, wildlife and lake swimming. Loved it, will be back next year. Stayed here for 5 nights in our motorhome and toured the northern Romantic Road with this campsite as a base. Very friendly staff. Easy stroll along the river into Ellwangen town centre, which is very attractive. Facilities spotless but may be insufficient in busy periods. Dogs welcome. Large Rewe supermarket a few minutes drive away (no parking for motorhome though). Would definitely stay here again. Nice site. Lovely, flat, large pitches. Facilities spotless and modern. Lovely views. The Wallenbad Ellwangen (wave pool) is next door. We didn't go but looked it up online and it was reasonably priced. Would you like to book AZUR Cp. Ellwangen a.d. Jagst or request more information? You can do both using the information below. Take the A7, exit 113 Ellwangen. Through the tunnel in Ellwangen, Turn right at T junction after tunnel. Over the bridge (railway and river) and first left. Follow the signs to the campsite. CampingCard ACSI will send your information request to "AZUR Cp. Ellwangen a.d. Jagst".